Bring people together to celebrate over fondue. In our fast-paced world, sometimes the best way to catch a breath and enjoy life's moments is around the dinner table. The Melting Pot aims to be your ideal event venue for any occasion, especially for groups that need a place that pleases all palates. Looking to host a dinner for 10 or more guests? Check out our large party menu below before calling, we have many dinning experiences to choose from that include savory cheese fondue, fresh salad, entrée, and chocolate fondue dessert. If you are looking to inquire more about menu items or book a large party please give us a call. Please note there is a $25 cake cutting fee. We Offer a Private Party Room (20-34 guests), Semi-Private Party Room (14-16 guests), or Seating for 10-12. Saturday Night Reservations may be booked for 5:30 or 8:30 seating. Please Click for More Details. OUR PRIVATE PARTY ROOM IS SEPARATE FROM OUR MAIN DINNING AREAS, HAS AUDIO/VISUAL CAPABILITIES, AND SERVICE FROM OUR FULL BAR. 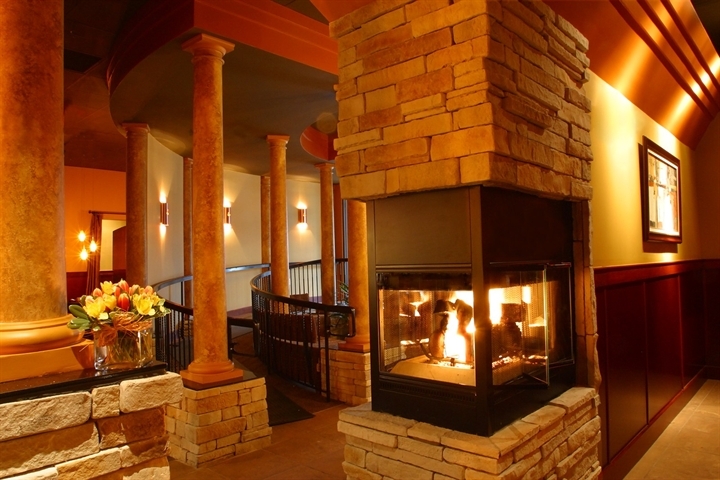 THE PRIVATE PARTY ROOM MAY BE RESERVED EXCLUSIVELY, FOR GROUPS OF 20-34 GUESTS. THE PRIVATE PARTY ROOM HAS 5 TABLES THAT CAN SEAT FROM 4-14 GUESTS EACH. SATURDAY NIGHT RESERVATIONS FOR THE PRIVATE PARTY ROOM ARE AVAILABLE FOR 5:30 OR 8:30 SEATING. OUR SEMI-PRIVATE PARTY ROOM OFFERS A TOUCH OF PRIVACY ADJACENT TO THE MAIN DINNING AREA. THE SEMI-PRIVATE PARTY ROOM MAY BE RESERVED EXCLUSIVELY, FOR GROUPS OF 14-16 GUESTS. THIS AREA IS COMPRISED OF 2 LARGE TABLES THAT COMFORTABLY SEAT 8 EACH. SATURDAY NIGHT RESERVATIONS FOR THE SEMI-PRIVATE PARTY ROOM ARE AVAILABLE FOR 5:30 OR 8:30 SEATING. GROUPS OF 10-12 ARE BOOKED IN OUR BAR AREA AT 2 ADJACENT TABLES OF UP TO 6 EACH. DIFFERENT SEATING OPTIONS MAY BE AVAILABLE MONDAY-THURSDAY. PLEASE SPEAK TO A MANAGER FOR MORE DETAILS. Set The Mood The Moment Your Brought To The Table. Includes 1 Mylar "Happy Birthday,Congrats,Happy Anniversary,ect" balloon & 3 assorted colored latex balloons. Relax, Sit Back and Enjoy A Romantic Evening In Our Exclusive "Lovers Lane" Booths For Two. Complete With The Extra Touches That Make The Evening One You Both Will Never Forget! Please Click For More Details. Not Available on 2/13,2/14, or 2/15. Dinner, Drinks,Tax, & Gratuity Not Included. If you really want to impress that special someone, make a reservation for our Ultimate Romance Package. Sit back and let us do all the work, but you can take all the credit. The Ultimate Romance Package includes your choice of a Fondue Delight or Fondue Fusion four course combination meal, private Lover’s Lane seating with a rose-covered table, a half-dozen roses, two Melting Pot champagne flutes (yours to keep as a special memento), a bottle of champagne and a silver picture frame along with a personalized menu. Not in the mood for champagne, but still want something sparkly and romantic? A rose-petal covered table awaits you with a personalized menu, a half-dozen roses and a silver picture frame. Dine on our Fondue Fusion or Fondue Delight accompanied by a bottle of sparkling cider or two of our fantastic non-alcoholic specialty drinks. End the evening with a picture and six Signature Chocolate Covered strawberries to take home with you. Please call for details and ask for The Ultimate Romance/Lovers package when making your reservation. *Not valid with any other offer or discount or on holidays or special events. Package price excludes tax and gratuity. Not in the mood for champagne, but still want something sparkly and romantic? This is the special evening for you. Seating is limited and reservations are required. Please call for details and ask for The Lover's Package when making your reservation. Roses are available to order for any special occasion,any purchase of 6 or more roses will require a credit card to hold the reservation. 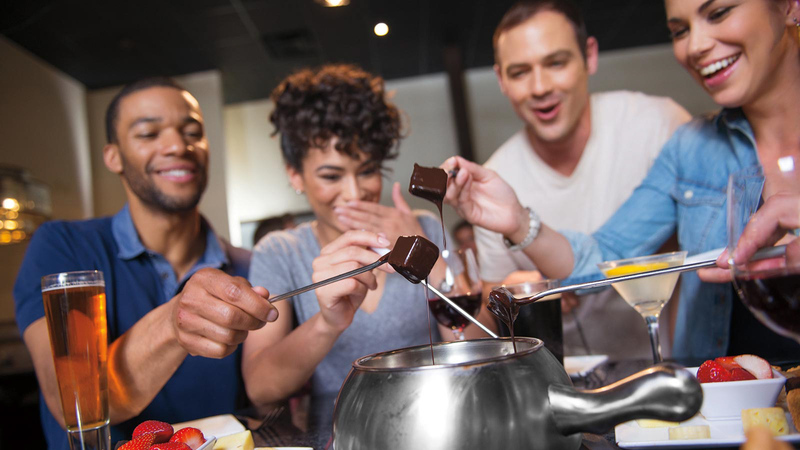 Remember your fondue experience with a photo of your evening in one of our silver Melting Pot picture frames.